The best luggage and backpacks should be lightweight and yet strong. They should be suitable for the type of luggage carried. Not quite so obvious a remark as one might think if one has ever watched an airport luggage carousel go round!!! One has to feel for the much maligned baggage handlers sometimes!!! Then there is the backpack - needs to be comfortable! The things we pack - from cricket bats to violins, from bikes to pictures, laptops, skis, surfboards, breakables and so on as well as all our clothes and things!! A variety of possessions. The luggage we need is nearly as varied. We need to consider what we are about to pack, how we are going to transport it and what we need to pack it in. When we are considering what to pack thought should be given not only what we would like to take, but can we take it. There are regulations these days on trains and boats and planes as well as coaches. Some of these are safety regulations and others are company regulations regarding space, weight etc. Have a look at the fine print, sometimes the regulations are buried there. Not so much a problem if one is using one's own transport, even then with a large family there well may be space problems. There are special considerations if one is hiking or cycling, one must pack very carefully and lightweight. UK Train companies are increasingly charging for carrying bikes, but will generally take folding bikes free if they are packed properly. So will National Express coaches. On a plane one must surrender one's possessions to be packed by others in the hold. Can the luggage withstand the type of handling it must have? Is it clearly labelled? Do not pack breakables in this luggage, put them in your hand luggage. Is the luggage tamper proof? Others putting illegal items in luggage hoping to take it out before it gets on the destination carousel certainly has been known. Make sure you pack your own luggage, do not let others do it for you. Does the luggage fit the size requirement? When the case is full is it within the weight limit? On a train large luggage needs to be placed in the places provided. Make sure it is locked securely, one is not necessarily seated close to keep an eye on it. 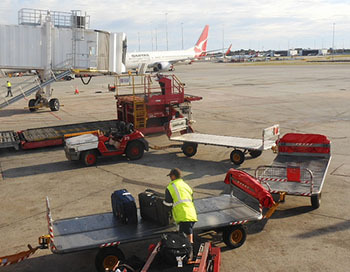 Other passengers may move your luggage around in order to get their own in safely. Can it withstand other's handling? In a coach luggage goes in the storage space underneath. Is the luggage clearly labelled and securly locked. The driver puts it in according to the places he/she will be stopping. Would be silly to place large luggage needed at the last stop in front of luggage needed earlier! One then gets on the coach luggage free apart from hand luggage. Quite pleasant actually. 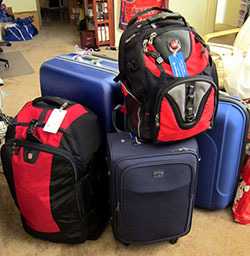 There are many types of luggage available these days for all sorts of items. Items will arrive in good condition if they are in suitable containers, securely locked and clearly labelled. Try the store in the right hand column, they have a myriad of ideas for what you are looking for. Then may be you might like to click one of the navigation buttons on the left and browse some more. Believe it or not Amazon sells luggage! Try this link There are plenty of suggestions here from suitcase, backpacks to locks and everything in between. Good prices and Amazon quality.